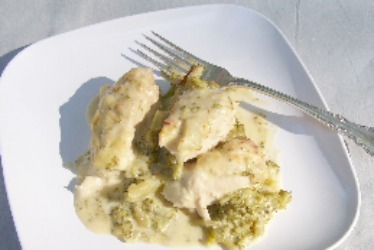 Chicken Divan Recipe is an Old Fashioned Recipe made with chicken, broccoli in a sherry sauce. According to history this gourmet dish was the signature dish of the famous New York, Divan Parisienne Restaurant, in 1950 Many folks credit them with developing this recipe. My recipe came from The Boston Cooking School Cook Book by Fannie Merritt Farmer. I tweaked the recipe twice, plus added instructions to cook the chicken breasts to enhance the flavors and tenderize the meat. Cut chicken breasts in half. Slice each half in three pieces cutting lengthwise. You will have 18 strips of chicken. Place pieces of chicken in a saucepan. Add celery, apple, onion and sage. Add enough water just to cover chicken. Cover. Bring to a boil on medium heat. Reduce heat to low and simmer until chicken is tender. Takes about 50-60 minutes. Turn off heat and let cool 10 minutes. Remove chicken with a slotted spoon. Strain broth and set chicken and broth aside. Remove tough stalk. Cut broccoli into bite size pieces. Place in a medium size saucepan. Add the cup of water. Cover. Bring to a boil on medium heat. Reduce heat to low. Steam until tender about 12-15 minutes. Remove from heat and drain. Arrange broccoli in a 2 1/2 quart casserole dish. Melt one tablespoon of the butter over top of broccoli. Sprinkle 2 tablespoon of the Parmesan Cheese over broccoli. Drizzle 2 tablespoon of the Sherry over broccoli. Lay the pieces of cooked chicken over broccoli. Sprinkle with 2 tablespoons of the Parmesan Cheese. Drizzle 3 tablespoons of the Sherry over chicken. In a skillet melt the 3 tablespoons butter on medium heat. Stir in flour until smooth. Gradually add the chicken broth cooking and stirring all the while until sauce is thickened like gravy. Beat egg yolks with a wire whisk. Stir in half and half until mixed well. Add this mixture to the sauce and keep stirring like you did the broth until it is thickened again to a thick gravy consistency. Remove from heat and pour over chicken. Sprinkle remaining cheese over sauce. Drizzle remaining Sherry over sauce. Place in a preheated oven 350F. until bubbly and heated through, about 40-45 minutes. Top should be lightly browned. This may be served over a bed of cooked rice or mashed potatoes. The rice and potatoes can be served as a side. Use this Chicken Divan Recipe to make a complete meal by teaming it with a delicious healthy salad. Our Waldorf Salad Recipe is an excellent accompaniment. And of course, a glass of Sherry would be nice for a special meal! As you can see this recipe has three components; broccoli, chicken, and sauce. It is time consuming to make, but well worth it for an amazing dish. Pushed for time? Cook the chicken and broccoli one day, assemble them into the casserole dish, cover, and refrigerate. Next day prepare the sauce, pour on top of the chicken, sprinkle on the cheese and sherry. Bake.